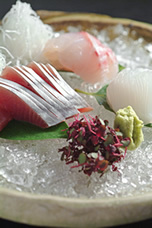 The restaurant [Isshinkyo] is located on the first floor of the Ryokan. 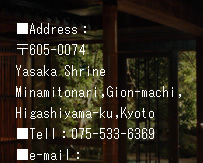 In addition to the house guests of the Ryokan, we always welcome visiting tourists and the locals our restaurant. Dishes mainly consist of local seasonal ingredients like kyo-yasai(kyoto vegetable), rare Yuzu from Mizuo, and exquisite Kyoto beef. Our specialities are yuzu-nabe (Dish served in the pot with Yuzu), Bou-sushi with Kyoto beef, seasonal Kaiseki-dishes, and rice cooked in Okudosan, a special furnace. We welcome you to enjoy the all the flavors. 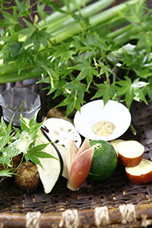 Kyoto is enriched with seasonal ingredients. Our experienced chefs take advantage of the best of these ingredients and prepare the most exquisite Kaiseki-ryori for every season. 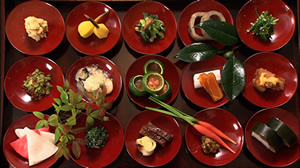 Please enjoy the exclusivity of these Japanese dishes at Isshinkyo. You will never grow weary of our "Seven-Night" made dishes. 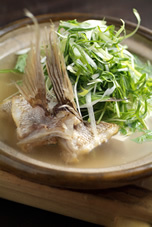 The basis of our Nabe is Yuzu. The savoru variations we offer are Yuzu-nabe with Yuba and red snapper, Yuzu-nabe with Hamo-eel, Yuzu-nabe with Matsutake ushroom and pork, and Yuzu-nabe with duck and stone leek. 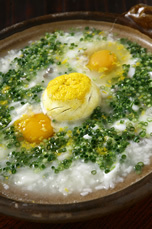 At the end of Nabe course, try our yuzu zosui porridge, and enjoy the aroma and flavor of the fragrant Mizuo Yuzu. We also made available other scrumptious Nabe dishes, such as Nabe dishes, such as Nabe with Grated Ttororo yam, Nabe with Suppon-turtle, and Nabe with Kyoto beef.